after all this exertion, he needs a bloody rest. Let Christmas be over, make it snappy! Christmas is just another day to me, with added food. I am a Happy Grumpus indeed, when it comes to this special day. Hate would be far too strong a word to describe my feelings for the day, I am just indifferent to it. My recipe for avoiding Christmas misery is, don't buy presents you can't afford, don't see people you don't like and stay in your pyjamas. Do what you can to enjoy the day, or at least get through it! Happy Grumpus to you all! I'm responding to your BC Broadcast but as you don't Follow me at BC I can't send you one in return. SNAP! Ha! ha! I enjoyed this doodle and the sentient too Claire. We don't celebrate Christmas and haven't done so for over 30 years now. We celebrate Winter Solstice with friends and then enjoy visiting with family and friends throughout the season of fa - la - la! Best wishes for a creative holiday season. Indifference pretty much sums it up for me. Happy Grumpus Day! This is an amusing picture to view. I've been contemplating taking a tiny vacation every other year for Christmas so that I don't feel rushed. I haven't taken any further steps beyond contemplation, but I rather like the idea of being in a far away place as everyone else hustles and bustles from one end of Los Angeles to the next. 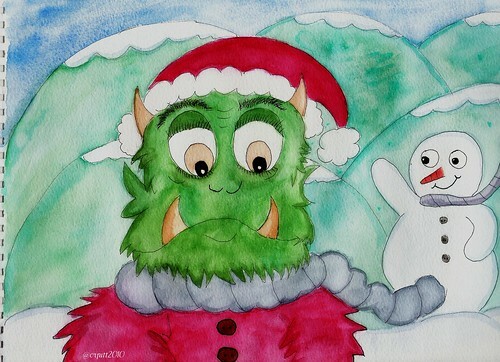 Happy holidays from one Grumpus to another! I think I'm going to subscribe to the Grumpus theory of the holiday next year and escape to someplace secluded with a good book and several alcoholic beverages to keep me company. Want to go with me?? I agree wholeheartedly and I think Grumpus is a great term for those of us who are a bit ambivalent to the day. Happy Grumpus Day to you! Can I stay in someone else's pyjamas? Sounds like someone needs some eggnog while watching It's A Wonderful Life. Without Christmas we wouldn't have Die Hard or Gremlins & the Queen wouldn't have an excuse to get dressed up once a year. Happy Grumpus Day indeed ^_^! When I was younger it was different and you got presents and you played around, no worries. Lately I don't rally care. I rather spend the day how I want to spend it haha...sooo stay in your PJ's and turn the music on!! I'm no fan of Christmas either. Happy Krampusmas, Grumpusmas, Jesusmas... oh, forget it. Happy Clairemas! Excellent advice :) Happy Grumpus! I'll have to admit that I'm not in a very festive mood this year either. I didn't even decorate and that is so unlike me. I liked Linda's idea about the book and some adult beverages. Excellent idea. Yes liking this particular Blog because this day which used to be a festive time for family and friends has turned into a laughable PR and commercial excersise just hate it. I love the holidays. Still, I love your Christmas 'recipe.' I love pajama days! Hopefully, you had an enjoyable day for you. Cheers! @70steen, What a shame they were stranded! All the snow has gone for now here. It was a cool yule, nice and quiet, just what the grumpus ordered. @TT, Snap indeedly :) It seems that most of us have had that power removed! boo. Hope you had a great time, sounds like you have the right idea! @NP, Happy Grumpus day indeed sir, I hope you managed an entirely indifferent day. @Lois, Thanks missus, the sprouts ended up being horrid though! Thank goodness for the cabbage. @Linda, Absobloodylutely! Sounds like a wonderful plan to me. Extra fluffy pj's and robes all round. @Tricia, Hey I am glad that I have a healthy grumpus support group that subscribe to my blog. We should all meet up one xmas and get drunk :) I don't subsribe to the jesus birth malarkey, so its just another day to me. @skdd, Oh how is it different! Hope you managed a PJ day! @James, Hey dude! I LOL'd at jesusmas :) Hope you had a bearable time! @Sandee, Oh I hope nothing is amiss that has led to this feeling? Maybe you can celebrate extra hard when you are on your cruise, surrounded by cool people! @Dyeve, Hello! Hope you are well? not seen you about in cyberworld lately? @Janene, get back evil christmas lover! hehe. It was indeed an enjoyable for me and I hope you had a great on yourself? I pretty much hibernated over Christmas. But I avoided going to sleep in the snow because I'm not a bear. Or a hedgehog (I hope our visiting hedgehog is okay). Does your Grumpus ever confuse his tusks with his horns? @Val, sounds like my type of Christmas, no sleeping in the snow for me either, I am not quite hairy enough. The question confused Grumpus, which is easy to do, so he is staring at himself in the mirror thinking about it. I love Grumpus! You'd wall-posted me about him about 10 months back on my Blogcatalog profile - but i hardly ever used that site, and i just revisited it today, because i started off two blogs recently.